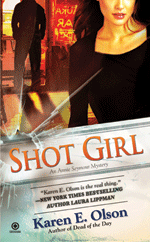 Mystery writer Karen Olson will be doing a full blog tour beginning next week when her fourth and latest Annie Seymour novel, Shot Girl, is released. 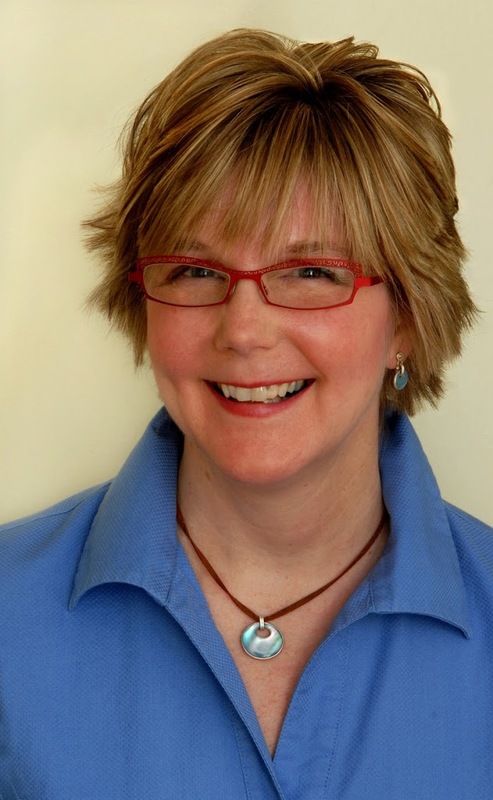 But because Karen is one of the nicest authors on the planet (seriously, you can tell that from her picture–she’s just as nice as she looks), she graciously agreed to pop out a few days early so she could be part of Octoberguest! Like her protagonist, Karen was a longtime journalist working in Connecticut. These days she keeps to the indoors and edits a Yale medical journal when she’s not writing novels. Annie Seymour gets to go out and do the truly dangerous work, but Karen keeps her stories authentic. Of her novel Dead of the Day, the Richmond Times Dispatch said: “Olson brings a journalist’s eye for detail and immediacy to this series. You’ll want to give yourself an early deadline to read her latest story.” Ditto for Shot Girl! I’ve got a new book coming out next week, on Election Day. I’ve been trying to come up with ways of promoting it, and the call from the Hartford Courant seemed to be a sign. I hadn’t approached anyone, she found me. Problem was, this won’t be the typical author profile story. It’s an At Home With feature. Which means my house is in the spotlight. I’m more of a backdrop, a sort of “Look at the nice author sitting in her fabulous living room” story. suburban neighborhood at the end of a cul-de-sac. We do have a lovely view off the back screened-in porch, which is why we’ve never enclosed the porch, but we don’t have granite countertops, fancy tiled floors, or a grand entryway. We’ve got mismatched furniture, cat fur, smudges on walls, and a broken door in front of our washing machine in the kitchen. I wanted to have those people on TV to come and build me a new house. does my house have mysteries? Do we decorate elaborately for Halloween? decoration, nothing that’s actually planned. The most interesting thing about our house was that the very first owners in the 1950s had built a plane in the basement. They would take it out to Tweed airport in New Haven and try to fly it, but they’d crash. since they hadn’t died in the house, we have no ghosts haunting us. our cats. Sadly, she’s a calico with just spots of black. If you had a reporter come to your house, what would they see? Thank you so much for sharing this, Karen! Last night, as I was hanging the tired paper skeleton we’ve had since God was a boy on the front door, I noticed that we also have plenty of for-real cobwebs. Also, the dogs had knocked over two plastic baskets of pansies I was too lazy to put in the ground. No reporters allowed! And that plane-in-the-basement story–that is very strange, very spooky, even if they didn’t die in the house! Fred is our spider in residence and is the first thing anyone sees at our house (weather permitting)if they approach. He’s about the size of a half dollar and likes to spin up a web over the front door. i think his eyes are bigger than his stomach. Fred is always gone for the important season of Halloween but he returns to be the watch spider when the temperature rises. I’m thrilled that I’m not the only homeowner who has real spiders as decoration. We do try to clear them away so the children aren’t too frightened when they trick or treat. Because we have a couple that could be Fred’s brothers, I think. For five days now, there’s been a large green dead grasshopper on the living room sill. I’m leaving as an experiment to see who notices it and moves it (or eats it) first. I love the plane story – Laura’s right – very spooky! Best of luck on the book! Karen, your series is at the top of my TBR pile, and it is at the top of the “reporter mysteries” handout I gave to attendees of my panel at Bouchercon.